We are a creative writing class from Broadway, Virginia. Like the writing you see here? 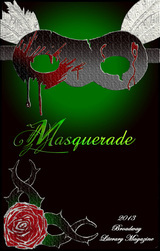 Check out our literary magazine, Masquerade to see more! Click the envelope at the top of the page to send us an email! The cost is 8$, but we will cover shipping to anywhere in the US! Click on the red names below to visit each person's individual page! Krysta - "Indulge within the darkness, madness, and genius of the life at hand." Tyler - "I'm like three years old." Matt - "Step back though time into a world that never was, a future that never shall be, and a present where we all wish to be." Libby - "Take a dark and twisted trip into my wonderland." Shania - "I write about love, the good and the bad, the happy and the sad." Jurni - "Live within, not without." Caroline - "Sarcastically, ironically, wittily. . . Poetic." Kayla - "Hakuna Matata.. . . Sorta'." Elizabeth - "Reading and writing poetry is a great passion of mine. My writing and short stories are sweet, innocent, and random, like me." Julia - "Love is painful, love is kind, love is selfish, Love is what's on my mind. Follow my words, listen in on my thoughts, every-thing's wild, love's got me locked. A world of fantasy, with tragedy too. What happens when the one you love doesn't love you?" Anthony - "'When forsaken by God, the wise man creates his own.' Fine. My God has a thousand arms, no legs, and is really mean to absolutely EVERYONE." Brandon - "When the void screams at you, just keep calm and scream louder." Jill - "Hi, I'm Jill." Moriah - "Vivid, expressive, and relate-able writing that inches its way into your heart." Julie - "Take a journey deep inside the life of a typical love-struck teenager. You'll be there though the ups and downs on the roller coaster ride that I call my life."